The Bath House known locally as the Roman Baths, perhaps became known as such, due to the find of Roman coins discovered at the site. The water is believed to have healing powers benefiting sufferers of rheumatism and other illnesses, which gave rise to the foundation of the local church and its naming as ‘St Martins’ the patron saint of saint cripples. The water flows at the same rate 365 days a year and at the same temperature of 63°C, this was extremely important and may well have been the catalyst for the formation of the village. The water is mineral rich and according to: Dr, Shorts treatise on Mineral Waters states that the water “can be drunk more freely than that at Buxton and is cooler”. There are two baths, one for ladies and the other for gentlemen, separated by a wall, each measures 3m x 4m and 1.5m deep and are accessed by stone steps. The once open air baths were covered over in Victorian times with its twin roofs and arched windows by Lord Denman, Lord Chief Justice of England who lived at Stoney Middleton Hall. However, it fell into a sad state of repair until in 1986 when the Parish Council initiated its restoration, with financial aid from the Peak District National Park. The building is now classified as a ‘Grade 11 Listed Building’ and treasured by the local community. A Brief Synopsis on Waters Entering the Stoney Middleton Bath Houses. 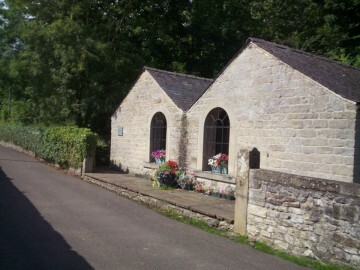 The Bath House at Stoney Middleton (comprising of one pool for men and one for women) can be found in the village of Stoney Middleton less than 200m from the A623 which forms the main Baslow to Peak Forrest road. The Bath House is fed from a small spring that issues approximately 10m to the north of the buildings which have been recently restored. Water from the baths, overflows into a small stream and then enters Stoke Brook which also takes drainage from Stoke Sough which lies within the grounds of Middleton Hall. The hydrology and hydrogeology of the area has been extensively influenced by the construction of underground drainage channels (locally referred to as soughs), over ground drainage work and culverting of surface water drainage. Physical Hydrological and Hydrogeological Investigations. Due to its comparatively small size the discharge from the spring supplying the Bath House does not appear to have been studied in terms of its discharge rate and its contribution to the hydrology of Stoney Middleton Village and/or the upper Derwent to which it ultimately discharges. Whilst the extraction minerals has occurred for many years in Stoney Middleton, the existence of a Bath House and Spring in Roman times, suggests that the current spring was in place prior to the establishment of relatively modern drainage practices. It may be that case that the flow from the spring may have reduced as a result of such practices, evidence for this could perhaps be better established by a more in depth mineralogical study of its discharge channel and associated environment. A rather brief review of the literature suggest that the waters entering the Bath House at Stoney Middleton have been subject of at least 5 studies over the past twenty years. Unfortunately, these studies have not looked in detail at the attributes of the individual spring, but rather the springs composition in the context of other natural springs, soughs and artificial groundwater supplies derived from deep boreholes. In all cases these studies were based on the collection of a water sample at a single given point in time and in no cases was a systematic study of physical (i.e. temperature), chemical and isotopic investigations within the context of the individual water source. It is also unclear as to the exact location actual samples were collected (i.e. at the actual spring, at the Bath House, at the discharge from the Bath House). For some measurements this may introduce few errors but some determinants may be affected by the residence time of the water in the baths and their construction. The spring water has a slightly alkaline pH (7.5 to 8.0) and contains measureable quantities of all of the common major element found in drinking water and groundwater’s (Calcium, Magnesium, Sodium, Potassium, Bicarbonate, Sulfate, Chloride and to a more limited extent Nitrate). Comparison of data sets collated to date (analysis undertaken in 1993 and 2006) for water from St Anns Well in Buxton and the Bath House spring indicate that water from the spring contains around double the concentration of Calcium, Sodium, and Sulfate and considerably more Chloride than water from St Ann’s Well. The overall total dissolved solids (TDS) content of the were between 400 to 420 mg/L in the case of St Ann’s Well and between 610 and 670 mg/L for spring water entering the Baths at Stony Middleton. The median from all wells sampled from the Carboniferous Limestone’s in Derbyshire was around 420 mg/L. The increased concentrations of Chloride and Sulfate in the Bath House spring are also observed in a number of other situations in the Eastern Part of the Derbyshire Dome and have been attributed to the waters having interacted with Lower Carboniferous evaporate deposits. The presence of Sulfate has also been attributed by a number to be due to the oxidation of sulfide minerals associated with the lead/zinc mineralisation found in the eastern part of the Derbyshire Dome. The spring water contained comparatively low concentration of all trace elements and is broadly similar in composition to other samples collected from the Derbyshire Dome. It does, however, contain minor quantities of Zinc, Strontium, and Fluoride which are elevated over regional averages. Levels of the dissolved gas Radon-222 are elevated compared with regional samples with a single measurements recording 125 Bq/L. Waters from the Bath House spring at Stoney Middleton are geochemically similar to those typically observed in thermal waters associated with limestone environments but differ significantly from those of volcanic origin. i.e. they show a major element chemistry dominated by Ca, Mg, and Bicarbonate. However, differences can be seen in respect to other thermal waters in Derbyshire and the United Kingdom. The temperature of the spring water entering the Bath House at Stoney Middleton is typically 18¬ oC. This temperature appears to have been consistent between studies made over the last 40 years although not much is known about short term changes in the parameter. This temperature is markedly less than that observed in the Buxton (27 oC) and at Bath (40 oC) but similar to thermal springs associated with limestone’s within the United Kingdom (Taff’s well 18.9 oC) and other sources in Derbyshire that are classified as thermal (Matlock Thermal springs (20 oC), Stoke Sough, (14 oC), Meerbrook Sough (17 oC)). Because of the higher temperatures of Thermal waters they often carry significantly increased concentrations of major elements due to an enhanced degree of rock-water interaction. From the above discussion water feeding the Bath house has higher concentrations of major elements than thermal waters associated with Buxton. They are closer in terms of TDS to thermal waters from Matlock (approximately 580 mg/L), although the distribution of major elements is somewhat different. In terms of TDS spring waters feeding the Bath House are considerably lower than those encountered in the spa at Bath (more than 2,000 mg/L). In terms of trace elements spring waters feeding the Stoney Middleton Thermal baths are broadly similar to waters from St Ann’s Well in Buxton in that they contain negligible concentrations of potentially toxic trace elements. This is in contrast to some other thermal waters that have been shown to contain elevated concentrations of As, Pb, Radium, Radon, etc. For example it is generally considered that the temperature rise by 26oC for every 1 Km you travel into the Earth’s surface. In the case of the hot waters at Bath consensus seem to suggest that the water is buried to a depth of up to 2.5 Km before travelling to the surface to discharge. The estimated maximum temperature that the water attains at this depth is 80 oC. What is the age of the spring: The spring almost certainly existed in pre Roman times (if origin of the Bath House is correct) but was it considered thermal at that time? Gareth Farr and Simon Bottrell (2013) The hydrogeology and hydrochemistry of the thermal waters at Taffs Well, South Wales, UK. CAVE AND KARST SCIENCE, Vol.40, No.1, 2013. C Abesser and P L Smedley (2008) Baseline groundwater chemistry of aquifers in England and Wales: the Carboniferous Limestone aquifer of the Derbyshire Dome, British Geological Survey, Groundwater Programme, Open Report OR/08/028. John Gunn · Simon H. Bottrell · David J. Lowe · Stephen R. H. Worthington (2006) in the Hydrogeology Journal, volume 14: pages 868–881. BANKS, D. (1997) Hydrogeochemistry of Millstone Grit and Coal Measures groundwater’s, south Yorkshire and north Derbyshire, UK. Quarterly Journal of Engineering Geology, Vol. 30, 237-256. Barry Smith and Don Bradley (1993) Trace elements, radium and radon in the Northern part of the Derbyshire Dome. Unpublished data collected during a BGS scoping survey during 1993. Hello, are the baths available to use or are they just to look at? I am planning to visit in early August. I’m sorry but it is not possible to use the baths at the moment. It is hoped that this will be possible in the future. I saw the baths mentioned on BBC Countryfile and wonder if they’ll be open by spring or summer 2017.